It’s common for families to encounter different kinds of disputes that can force members to turn against one another when things escalate for the worst. But those who put their pride above their family often feel remorse after an unfortunate circumstance causes the unit to fall apart forever. Thus, it’s important for a family to come together to talk through issues that affect them. These points and concerns are usually reflected in a meeting agenda for the entire family to tackle. 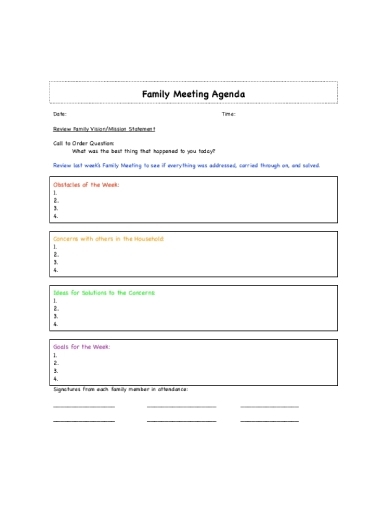 There are various ways to note down the agenda of your family meeting. 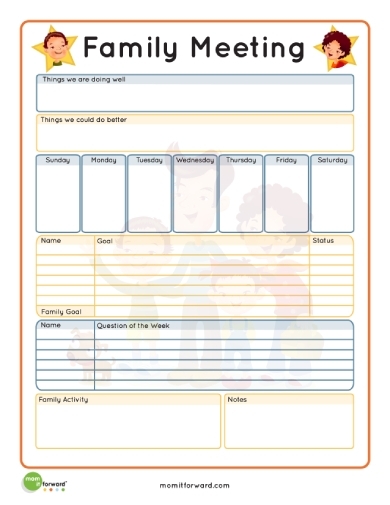 A chart, for instance, makes it easy for parents to work on key dates to remember, and a task checklist to accomplish before the end of a given period. This will keep every member of the family involved in each activity, whether or not it fully concerns them. Sooner or later, each member will learn to participate and engage in your family meetings to turn it into a tradition worth practicing. There’s nothing wrong about wanting to stay organized with everything you do. Some things can be achieved more effectively if you plan them out beforehand. 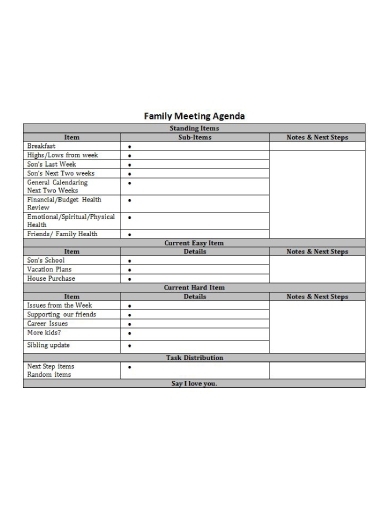 The agenda above shows how you can turn your family meeting into a detailed management of day-to-day chores. 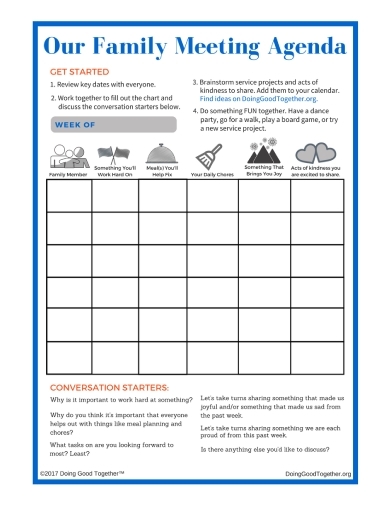 This can be useful for parents who run on tight schedules but still want to make their family a priority in their plans. This will also keep members updated on the latest happenings and changes that might affect them one way or another. It can be difficult to manage a household of kids. If having a child requires great responsibility, just wait until you welcome another bundle of joy into the family. 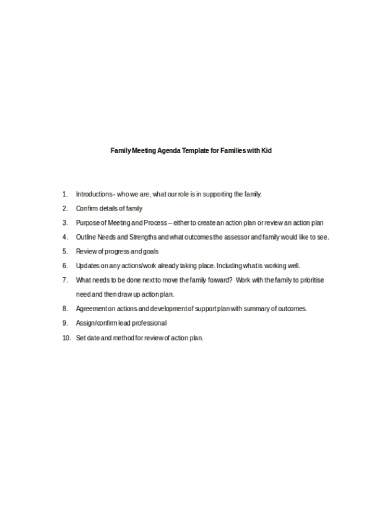 In most cases, family meetings are called for the unit to develop or review an action plan. This will allow you to outline the strengths and weaknesses that need to be addressed to put everyone on the same page. It’s also important to keep the kids involved in the discussion so they may be aware of any decisions that concern them. While you can’t expect your kids to make rational decisions on every matter, there are certain areas in the household that they can play a part in. For families with toddlers and grade-schoolers in their unit, this family-friendly meeting agenda will allow each member to fully engage in the discussion and voice out their concerns on areas that require improvement. You can have your kids fill out the sheet with the necessary information and gather everyone for a meeting to cover what was written. Some people find it difficult to express themselves during family meetings and interventions in fear of being judged or ridiculed by others. One way to ensure that every single person in the unit is given the chance to speak up is to plan out what needs to be addressed during the meeting. The agenda should cover the basics of a meeting, such as the time, date, and venue, along with the topics to tackle within the allotted period. 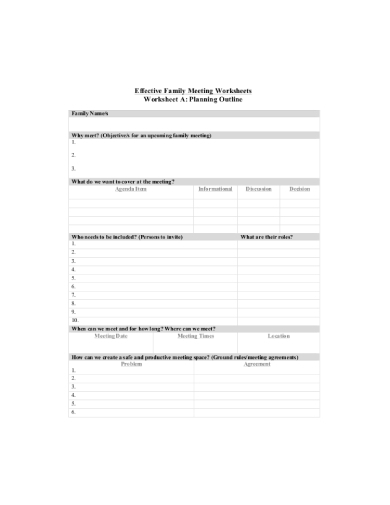 Having an outline will also make it easy for you to prepare the essentials to carry out a successful family meeting. As a family, you are a team that is tied by marriage, blood, or adoption. Every team encounters a series of obstacles that will test their ability to overcome the struggles that threaten their relationship. Families that run businesses together as spouses, siblings, or relatives will likely face a variety of challenges that need to be addressed as a team. 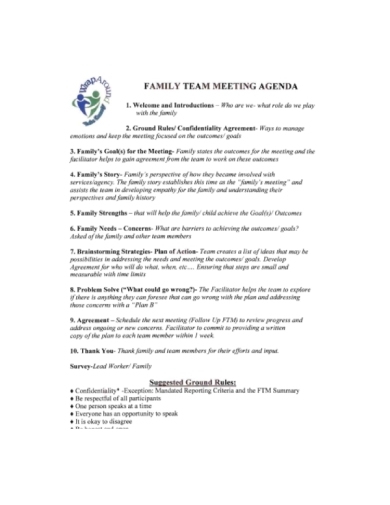 For large family meetings, you would need a more professional meeting agenda to make sure all sides are heard and considered before a crucial decision is made. 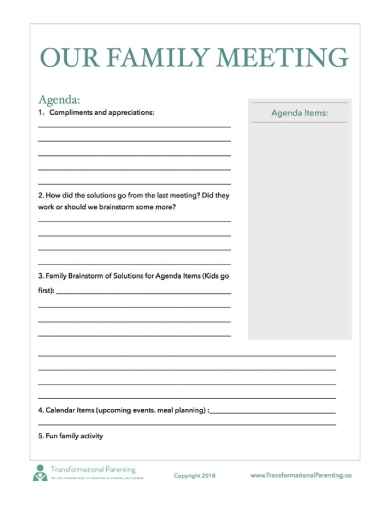 If staying consistent and organized is your secret to a successful outcome, consider using a formal agenda for your family meetings. 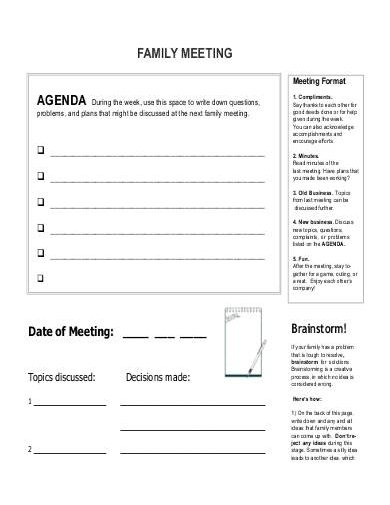 This template will make it easy for you to note down important topics and decisions that were established during the assembly. By doing so, you can agree on a solution to common problems experienced by each member of the family. Contrary to what many believe, family meetings don’t always have to tackle serious issues and negative events that transpire within the unit. In fact, you can use this as an opportunity to nurture your spouse and kids by expressing your appreciation for their contributions to the family. Complimenting one’s works and actions is also a great way to keep them motivated during the toughest times. It’s always best to inspire your family to do better and be better in order to pursue a healthy upbringing for your children. If there are matters you want to raise with the rest of your family, feel free to write them down in a sheet dedicated to your next meeting. You can put up the agenda in a common room to make it easy for members to jot down their concerns before they end up forgetting. 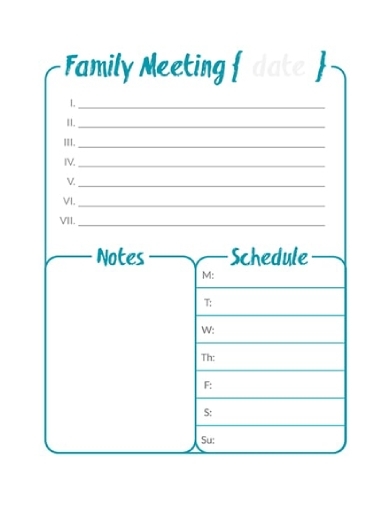 A daily schedule may also be included in the sheet to deliver information regarding the upcoming meeting with your family. It’s best to keep this as simple as possible to avoid any misunderstandings with those involved. A lot can happen within a week, with some events being heavier than others. One way to stay open with your family about matters that bother you is to hold weekly meetings where you can express your problems and concerns. Family discussions are crucial in maintaining a healthy household for all. Being transparent with your family might not be the easiest thing in the world, but it does allow you to develop a level of patience and understanding toward each member.